Continuing its quest of connecting people and brands through great experiences, London based The Conversion Group (TCG) has partnered with Wine Riot, a creative US team reinventing the wine experience for the millennial generation. Wine Riot aims to change the often-intimidating nature of wine and wine tasting into an entertaining and educational experience. 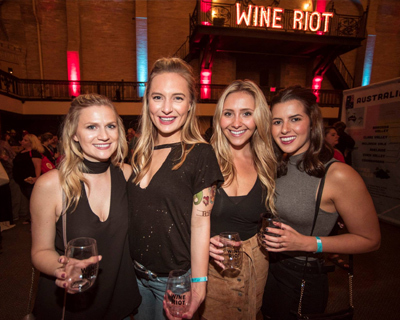 “We wanted to create an event with a fun, friendly and inviting atmosphere, that entices people to come and learn about wine”, says Tyler Balliet, Founder and President of Wine Riot. Tyler together with Morgan First, the co-founder and CEO of Wine Riot, put together a team of experts to give their visitors Wine 101, crash courses loaded with tips and tricks to make the world of wine more fun and approachable, to support this, Tyler Balliet built a mobile app that features a basic profile of every wine showcased, and helps customers to rate and remember their favourites. Allen Gibbons, CEO at The Conversion Group, comments: “I am thrilled to welcome Wine Riot and its founders Tyler and Morgan on board, their approach to wine education through engagement fully resonates with our own ethos and I think the growth opportunity for Wine Riot is enormous”. Now in its seventh year, Wine Riot hosts spring and autumn tastings in Boston, Chicago and New York.